Your baby now weighs between 9-10 grams and its crown to rump measurement will be roughly 5cm. The proportions of the baby are changing again as the torso grows longer in relation to the head. There is more movement from the baby again this week; these are becoming smoother and less jerky. Don't worry that you can't feel these movements yet though, you will probably be at least 16 weeks pregnant before you feel anything, although if this is not your first child you may possibly feel them sooner. Those tiny fingers and toes are now separated (no more webbing) and while it is several weeks until the nails form, the nail beds are now in place. 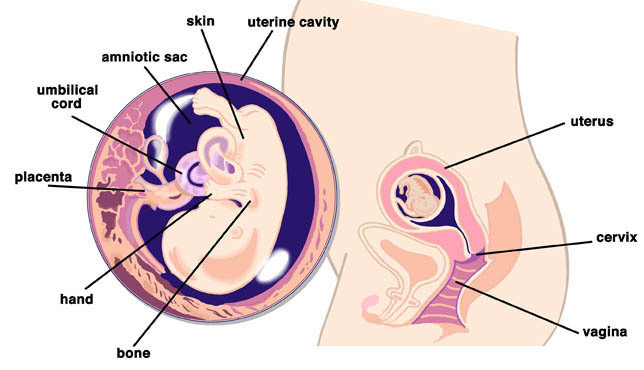 The foetus still has a long way to go, but surprisingly, tiny details are already being added, such as hair follicles. Have you been experiencing more vivid or unusual dreams than normal? If you have woken up with horror, recalling with great detail a dream where you accidentally breast fed the cat; gave birth to a tiny alien or you forgot you were pregnant and washed down a packet of cigarettes with a bottle of wine, then don't panic, this is perfectly normal. You most certainly are not losing your mind. On the contrary, this is your brain's way of sorting out the mass of confusing, contradictory and worrying thoughts that are running through your head every day. Unsurprisingly, our hormones are also partly to blame, but so is the light sleep you may be experiencing. Waking frequently means that you are more likely to wake during the middle of a REM dream cycle. This means the dreams are so fresh in your memory that you recall them more clearly. Make sure that your diet is still on track for a healthy pregnancy. Of course you are likely to overindulge here or there but make sure that at the same time you are still getting all the key nutrients that you should be getting. Make sure that you are having at least five portions of different kinds of fruit and vegetables every day. Check that you are getting enough protein and calcium as well. Increase your fibre intake by eating brown rice or pasta and wholegrain breads. Did you know that you should be eating two portions of oily fish every week? Talk to your midwife about supplements; you should already be taking folic acid, but in addition to this you may want to take a multivitamin specifically designed for pregnancy. Even the most conscientious of meal planners is liable to be short on some of the recommended vitamins and minerals. That said, you should not rely solely on supplements as they can never replace a good diet. Do check that what you are taking is appropriate though, as there are some vitamins that you should ensure you do not have too much of, such as vitamins A and D.
Page generated in 1.3454 seconds.